Sri Lanka Linux Hosting Review 2019: Is Sri Lanka Linux Hosting a Good Hosting? Sri Lanka Linux Hosting was started in 2005 and provides web hosting via data centers in the U.S., Singapore, and the U.K. Hosting options include shared, VPS, SEO, semi-dedicated, and dedicated server, and use Intel Xeon servers. Founded in 2005, Sri Lanka Linux Hosting provides web hosting via servers in the U.S., U.K., and Singapore. It offers shared, VPS, SEO, semi-dedicated, dedicated, and reseller hosting as well as domain registration. It features a 99.9% uptime guarantee with SLA and its website is in English. For shared hosting, customers can choose either U.S., U.K., or Singapore server locations, and data for these plans comes in three levels. The entry-level Bronze plan provides 1GB of RAID storage and 50GB of monthly data transfer, and the Silver plan 2GB of storage and 200GB of monthly transfer. Users who require more data, processing power, or control can upgrade to a VPS, or higher plan. The U.S. or Singapore-based VPS plans allow for 5GB-40GB of storage and 250GB to unmetered monthly traffic bandwidth. These are using quad core Intel Xeon servers for high performance. Another service Sri Lanka Linux Hosting offers is its SEO hosting. This allows one customer to have many different C-Class IP addresses, which can be used to link to each other with the goal of increasing your website’s SEO results. 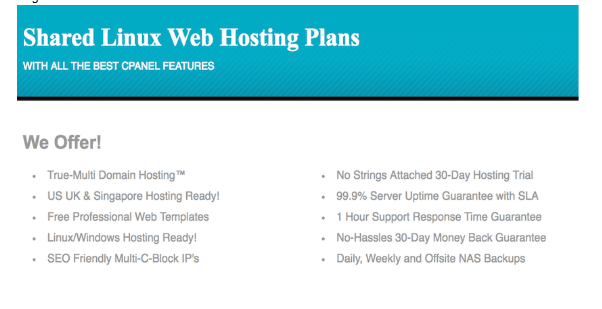 These plans come with either 20, 50, or 100 C-Class IP’s and feature separate cPanels and name servers for each domain. The hosting is done via the U.S. data center. For customers who would like a website building tool, all Sri Lanka Linux Hosting shared plans come with RVsitebuilder. This tool lets you create a simple, but effective website using premade templates and a drag-and-drop designer. Websites created end up being responsive, so they look good on any size display, whether computer, tablet, or cellphone. Sample content you can add to your website includes: blogs, image galleries, and Google maps. Pricing for the America-based VPS, semi-dedicated, dedicated, and SEO hosting is quite a bit higher than you would find from a North American firm for a similar data allowance. A leading American firm advertises a similar plan for around 84% less. 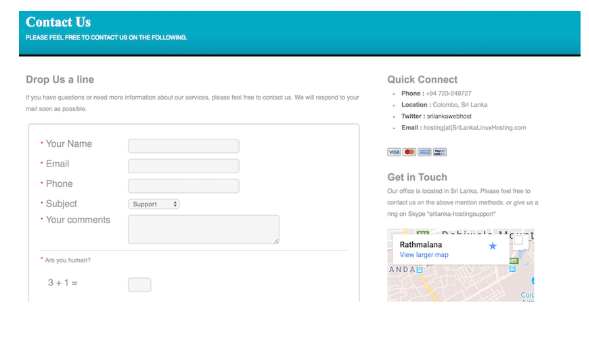 Support for Sri Lanka Linux Hosting is handled via telephone, email, Twitter, or Skype. A one-hour support response time is advertised for customers. I reached out with a general sales query but never received a response. Sri Lanka Linux Hosting offers a number of different web hosting options including shared, VPS, SEO, semi-dedicated, and dedicated via data centers in several locations. Pricing for its entry-level shared plan is affordable but other services, like VPS, are much higher than competitors. Wondering how Sri Lanka Linux Hosting stacks up against other Web Hosting companies? Enter any other Web Hosting company and we will give you a side-by-side comparison.